15th 360 degree HDRI Panorama release. High resolution for background and small one for lighting cg scenes. There seems to be a problem unpacking many of these HDRI Panorama zip archives from openfootage.net. Tried to download numerous times and tried to unpack with various programs, 7-zip, winrar etc. I have a question… for setup light correctly in the scene… exif data are missing. where to get this data? the hdr seem to don’t be real hdr but just LDR saved as hdr. I compared your image with other hdr on the net… well when I use it with an unbiased rendering engine and the sun is visible in the rendered image… the point of highest brightness is brown instead to be near to whithe… so no light contribution. so very nice images… but not usefull as hdr. if you want I can send you the renderd image. hello jinj the hdri´s are taken with 9 different exposed pictures put together to the to one hdri. So with the total of 81 raw pictures will make one panorama hdri. Of course with nine exposed pictures i can not capture the sun with it´s brightest point. But practically that is not necessary as most of all renderes use for their GI Solution some kind of simplified map f.e. irradiance map (vray) where the sun would , as some kind of very bright pixel, be blurred away or just produce render errors. With unbiased Renderes you can us a hdris with very bright pixels like the sun but that would cause very much noise and long render times because most of the light has to be sampled from very few pixels. so on the left side sharper shadows cause of full resolution map with bright pixels. 1. Use together with the hdri Ligthing a directional light that will produce sharp shadows which are very good controllable. 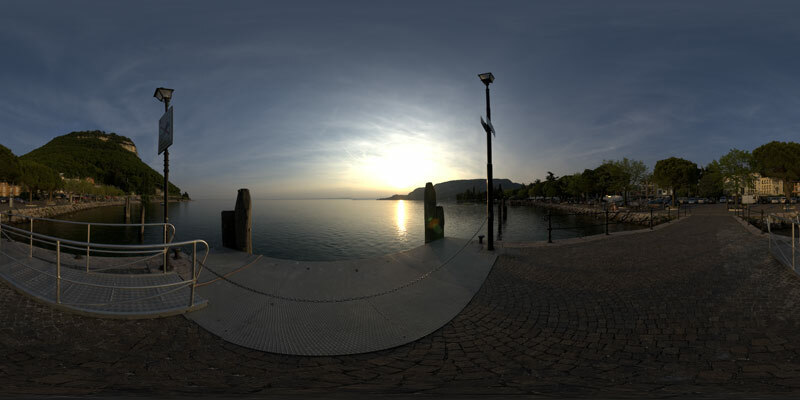 ….and in the lago di garda hdri the sun is not very bright at all because of the sunset and the time of shooting.